‘Why do cats understand what you say?’ ‘Where does hair go when you go bald?’ ‘How can the city control illegal bicycle parking?’ These are just some of the questions that Marcus Coates has attempted to answer by descending into the ‘lower world’ and consulting the birds and animals that he encounters there. Usually they respond in cryptic clues; uncharacteristic behaviour is what he is looking out for, which he then does his best to interpret for his audience on his return. Coates was inducted into the ancient techniques of shamanism on a weekend course in Notting Hill, London. The workshop trained participants to access a ‘non-ordinary’ psychic dimension with the aid of chanting, ‘ethnic’ drumming and dream-catchers. Coates has explained the process as essentially being a form of imaginative visualization. Historically the shaman would have been employed to solve the daily problems of the community; since these usually involved the finding and killing of animals, shamans were valued for their ability to communicate with other species in the spirit world. Shamanism’s contemporary abstracted form in the West still relies on animals as ‘guides’, but it encourages practitioners to project personal spirit worlds in terms that are familiar to them. During his trance the man sitting next to Coates met and talked to a gerbil. Coates himself is a keen ornithologist and naturalist; the animals that he encounters in the ‘lower world’ are usually from areas of British landscape that he knows intimately. Much of his past work has reflected his sense of alienation from such places, a frustration that manifests itself in the sentimental yearning to ‘get back to nature’. Indigenous British Mammals (2000) was Coates’ ludicrous attempt to reverse the flow of anthropomorphism and subsume himself within the fabric of the natural world, emulating wild animal calls while buried under the turf of deserted moorland; in Goshawk (1999) he persuaded foresters to fasten him to the upper branches of a Scots pine so he could see the world through the eyes of a hawk scanning for prey. While the humour of these works springs from the naivety of the desires they embody, by subjecting himself to such vivid, visceral experiences Coates holds on to the possibility of personal transformation and so restrains them from snide satire. The ambiguity of Coates’ own investment in the processes he embarks on creates a constant itch in the understanding of his position; who is laughing, and whom exactly are they laughing at? This question was at the forefront of his first shaman work, Journey to the Lower World (2004), in which he filmed himself performing a shamanic ritual in the front room of a Liverpool tower block that was scheduled for demolition. 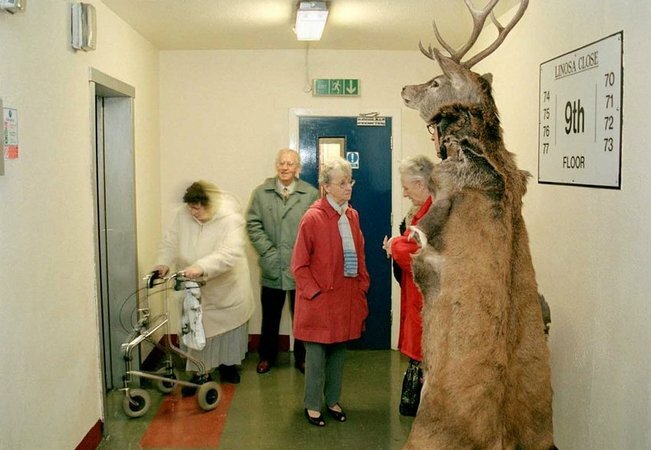 The audience of bemused residents fought to suppress their giggles as Coates, dressed in the skin of a red deer, began by vacuuming and spitting water onto the carpet, then emitting feral whistles, grunts and barks as he entered the ‘lower world’. Despite his audience’s obvious scepticism (of both shamanism and of the contemporary art world), the question they asked Coates about the lower world was sincere and unguarded: ‘Do we have a protector for this site? What is it?’ He had gained their trust and implicated himself in an intimate system of exchange. His tentative answer, interpreting peculiar feather patterns on a sparrowhawk’s wing as being indicative of the community’s need to ‘stick together’, acknowledged this responsibility. While remaining deeply uneasy about the employment of artists in the public sphere as ‘problem solvers’, Coates has said that often the most valuable thing that comes out of such performances is the audience’s sense that they are being listened to. This in turn prompts them to begin talking objectively about issues that concern them, even if, as in the case of Mouth of God (2006), it is to a man with a stuffed hare strapped to his head. This is Coates’ best trick; despite looming large in the production of his works, he somehow manages to usher people towards a revelation of sorts within themselves. He achieves this again in his work Dawn Chorus (2007), the most recent and accomplished of an ongoing series of works in which he teaches people how to mimic birdsong by copying slowed-down recordings of birds, filming them and then speeding up the footage to avian pitch again. The multi-screen video installation shows 19 people caught alone in quiet moments, intermittently breaking into birdsong. While the ornithologist in Coates clearly relished the challenge of reproducing the sequence and positions of a dawn chorus in the gallery, the real magic lies in the videos’ knack of not only creating highly convincing birdsong but also accelerating human movements into the nervy fidgeting of birds. The melancholy of Dawn Chorus is born of the solitary figures’ isolation, not only from the world of the birds and the beasts but also from each other. Deceptively, Coates’ real subjects are not the outdoors and the unknown but interiority and introspection. This is the true locus of ‘nature’ in the modern world, he seems to imply; not in the open spaces of the countryside, so obscured by cultural projection and anthropomorphism, but in the withered memory of something wild and ancient, buried deep within ourselves.